Looking for a Christmas gift for someone who loves to cook? Whether they are a pro chef or simply love to eat, these gifts are perfect for moms, dads, friends, teachers, brothers, and sisters. Find some splurge options as well as some super affordable gifts… and all are available on Amazon! Happy Wednesday! It’s day 2 of Thankful for You Week over here at Maison de Pax. Day 1 started with a gardening gift guide and a chance to win my favorite gardening tool! Pop on over there to enter to win if you haven’t already. Now today is super exciting, too! I’ve rounded up my favorite kitchen items available on Amazon… Am I the only one who lives off of Amazon prime?! Let’s make shopping super easy this year and save more time and energy for fun and loved ones. 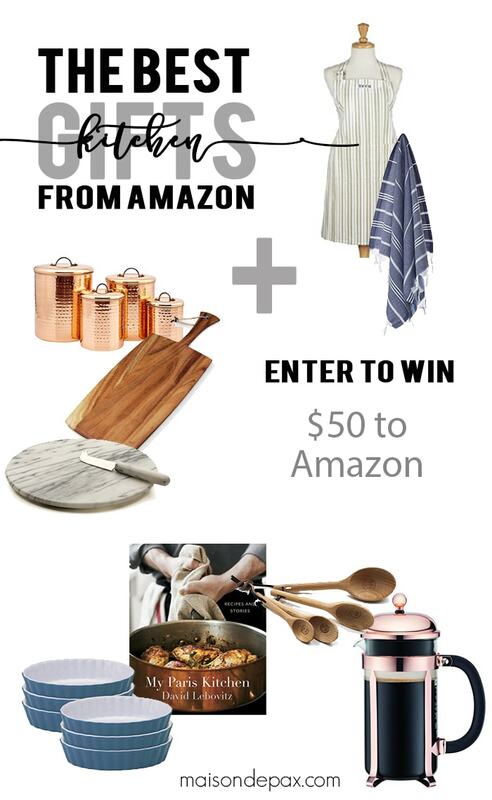 PLUS, I’m giving away a $50 Amazon gift card to help one of you purchase those fabulous gifts! Oh, and I promise I won’t tell you if you decide to spend it on yourself instead. 😉 Enter to win below. Thank you for being such amazing readers! Just stumbled across your blog and LOVE your style.Would love to win this! I like silpat baking mat and the wooden spoons! Loving those COPPER CANISTERS!!! GORGEOUS! Thanks Rachel! My favorite is the silmat baking mat and the creme brulee dishes. I want that culinary torch. I’ve always wanted to one to make fancy desserts! My favorite is the Kitchen Aid. I have an older, basic white one that I love, but I am loving that Ice blue color! I am nuts over the Moscow mule mugs! Santa needs to think about that. Amazon is my go to gift shop too! The prime shipping has saved me numerous times! My favorite is the Copper Kitchen Canisters. They are so pretty and would e fab in my kitchen. LOVE the kitchen aid mixer!! Gorgeous color! Those copper containers are gorgeous!! I love the kitchen towels and copper canisters! Came across your blog from Pinterest and am loving it! I like the Copper Kitchen Canisters the most. What a great gift guide! I love the copper French press. I didn’t know they could be made in different finishes! I love the copper French press. I have wanted one for a while. The copper canister set is gorgeous… thanks for the chance to win! My favorite is the KitchenAid Mixer! It’s in such a pretty color. My favorites are the copper mugs and canister set. My favorite is the Copper French Press. I love the creme brulee ramekins! Love these ideas! I’m making family recipe books for my daughter and her best friend (who is like a daughter to me) as Christmas presents so these are cute ideas to add to them! I would love to have the Kitchen Aid Mixer! Awesome! Some great ideas for the foodie in your life (who, by chance, may be yourself!). Love the torch! How could I pick a favorite?! It’s all so dreamy! A French Press is on my wish list and this one is stunning! Copper Canister Set of course. But all these would make a wonderful gift. The Kitchen Aid Mixer is my favorite item! I love them! These are cool guides, Rachel! My favorite is the KitchenAid Mixer in Ice. I love the copper kitchen canisters. Those copper kitchen canisters are gorgeous! Definitely my favorite item in the kitchen gift guide. Nice! I’d definitely like a bunch of these ideas! I really like that #15-Rabbit Wine Opener, I need a great wine opener for entertaining guests this holiday season. The KitchenAid mixer is definitely my favorite item in the gift guide! My favorite is the KitchenAid mixer but I already have one, so that’s why I know it’s so great! I love the culinary torch! Love the Kitchen Aid mixer…..great colour! The KitchenAid Mixer is one of my favorites!! I love the copper french press! i love the moscow mule mugs! My favorite item is the Kitchenaid mixer! Love the culinary torch! Perfect for meringue. Love the Kitchen Aid mixer – I’ve always dreamed of having one. I love the marble cutting board! Such great gift ideas. The KitchenAid Mixer in Ice! Love it!!! I love the apron and well just about everything there. Wow, so many wonderful gift choices. I’d have to decide later! Love hose Moscow Mule Mugs! Happy everything! Love the copper kitchen canisters! So gorgeous! I love Amazon and have my eye on the Kitchenaid Pro mixer.